Cvetanov Cv., Chenchev I., Bakardjiev A. Purpose: The aim of this science report is to show a rare case of multiple impacted teeth at adult patient and our propose clinical approach. Materials and methods: The clinical case is showed from adult man /64-year old/ with multiple impacted teeth (6 impacted teeth in the anterior place on the mandible) were not suggestive of any syndrome or metabolic disorder. The extraction of the impacted teeth was made on two stage with piezosurgery unit under local anaesthesia. For prevention of postsurgical complications, as a swelling and prevention of postsurgical resorbtion were used coneshapes from pressure xeno colagen. To base on clinical and radiological examination we will discuss the differential diagnosis and we will offer a clinical approach about decided the case. 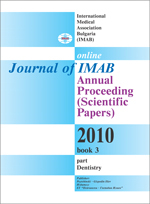 Result and Conclusion: The incidence of multiple retained teeth by literature research range from 10.9% to 40.4%, most frequently is the retention of the third molars. In the literature most rarely have clinical reports about multiple retained teeth which differ from third molars at adult patients. The rare clinical case we showed is very demonstrative and the medicative approach which we used gave excellent result. Key words: mandible, multiple retention.